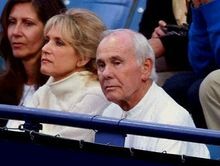 From the White House to Hollywood, the loss of Johnny Carson is hitting home. The 30-year host of the "Tonight Show'' died yesterday at 79. NBC says Carson's death was the result of complications from emphysema. At the request of his family, there won't be a memorial service. Johnny Carson didn't invent the late-night TV talk show but he made the most of it. His "Tonight Show'' monologues, celebrity banter and the corny but winning skits all had the Carson touch of heartland charm and humor that remained on the polite side of risque. When he died Sunday, his quiet retirement of nearly 13 years hadn't dimmed the memory of his three decades as king of late-night or the admiration of entertainers and others. Carson died early Sunday morning, according to his nephew, Jeff Sotzing. He did not provide further details, but NBC said Carson died of emphysema -- a respiratory disease that can be attributed to smoking -- at his Malibu home. Carson often had a cigarette in hand in the early years of "Tonight,'' eventually dropping the on-air habit when smoking on TV became frowned on. But he remained a heavy smoker for some years afterward, said a former associate who spoke on condition of anonymity. 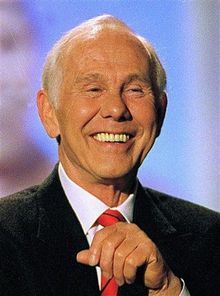 The boyish-looking Iowa native with the disarming grin, who survived every attempt to topple him from his late-night talk show throne, was a star who managed never to distance himself from his audience. His wealth, the adoration of his guests -- particularly the many young comics whose careers he launched, like Letterman -- the wry tales of multiple divorces: Carson's air of modesty made it all serve to enhance his bedtime intimacy with viewers. But America never tired of him; Carson went out on top when he retired in May 1992. Actress-singer Bette Midler, who memorably serenaded Carson on his next-to-last show with "One More For My Baby,'' recalled him warmly Sunday. "I was his last guest, and it was one of the most moving experiences of my life. He had it all. A little bit of devil, a whole lot of angel, wit, charm, good looks, superb timing and great, great class,'' Midler said in a statement. His generosity to up-and-coming comics who got their big break on "Tonight'' was lauded by Bill Cosby and others. "Johnny was responsible for the beginning and the rise of success for more performers than anyone. I doubt if those numbers will ever be surpassed,'' Cosby said in a statement. "When we ended our run on 'The Tonight Show' and my professional life continued, whenever a big career decision needed to be made, I always got the OK from 'The Boss,''' McMahon said. Carson's personal life could not match the perfection of his career. Carson was married four times, divorced three. In 1991, one of his three sons, 39-year-old Ricky, was killed in a car accident. 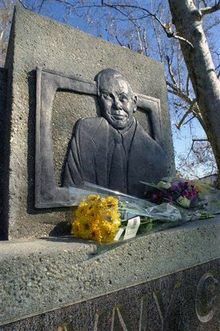 Nearly all of Carson's professional life was spent in television, from his postwar start at Nebraska stations in the late 1940s to his three decades with NBC's flagship late-night show. Carson chose to let "Tonight'' stand as his career zenith and his finale, withdrawing into a private retirement that suited his nature and refusing involvement in other show business projects. "I just let the work speak for itself,'' he told Esquire magazine in 2002. Carson did find an outlet for his creativity: He would send a joke occasionally to Letterman, who lost the battle for "Tonight'' but remained a Carson friend. Some bits made it into Letterman's monologue. Carson made his debut as "Tonight'' host in October 1962 and quickly won over audiences. He even made headlines with such clever ploys as the 1969 on-show marriage of eccentric singer Tiny Tim to Miss Vicki, which won the show its biggest-ever ratings. In 1972, "Tonight'' moved from New York to Burbank. Growing respect for Carson's consistency and staying power, along with four Emmy Awards, came his way in the late 1970s. His quickness and his ability to handle an audience were impressive. When his jokes missed their target, the smooth Carson won over a groaning studio audience with a clever look or sly, self-deprecating remark. Politics provided monologue fodder for him as he skewered lawmakers of every stripe, mirroring the mood of voters. His Watergate jabs at President Nixon were seen as cementing Nixon's fall from office in 1974. He made presidential history again in July 1988 when he had then-Arkansas Gov. Bill Clinton on his show a few days after Clinton came under widespread ridicule for a boring speech at the Democratic National Convention. Clinton traded quips with Carson and played "Summertime'' on the saxophone in what was hailed as a stunning comeback. There was the occasional battle with NBC: In 1967, for instance, Carson walked out for several weeks until the network managed to lure him back with a contract that reportedly gave him $1 million-plus yearly. In 1980, after more walkout threats, the show was scaled back from 90 minutes to an hour. Carson also eased his schedule by cutting back on his work days; a number of substitute hosts filled in, including Joan Rivers, Jerry Lewis and Jay Leno, Carson's eventual successor. "No single individual has had as great an impact on television as Johnny. 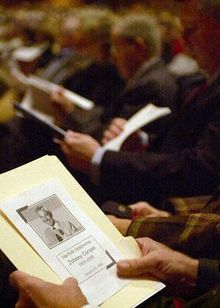 He was the gold standard,'' Leno said. In the '80s, Carson was reportedly the highest-paid performer in television history with a $5 million "Tonight'' show salary alone. His Carson Productions created and sold pilots to NBC, including "TV's Bloopers and Practical Jokes.'' Carson himself made occasional cameo appearances on other TV series. He also performed in Las Vegas and Atlantic City, N.J., and was host of the Academy Awards five times in the '70s and '80s. Carson's graceful exit from "Tonight'' did not avoid a messy, bitter tug-of-war between Leno and Letterman to take over his throne. Leno won, and on May 25, 1992, became the fourth man to hold the job after Steve Allen, Jack Paar and Carson. Letterman landed on rival CBS. After World War II service in the Navy, he took a series of jobs in local radio and TV in Nebraska before starting at KNXT-TV in Los Angeles in 1950. There he started a sketch comedy show, "Carson's Cellar,'' which ran from 1951-53 and attracted attention from Hollywood. A staff writing job for "The Red Skelton Show'' followed. 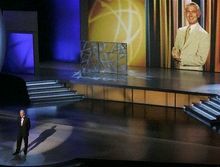 The program provided Carson with a lucky break: When Skelton was injured backstage, Carson took the comedian's place in front of the cameras. Producers tried to find the right program for the up-and-coming comic, trying him out as host of the quiz show "Earn Your Vacation'' (1954), the variety show "The Johnny Carson Show'' (1955-56), the game show "Who Do You Trust?'' (1957-62). A few acting roles came Carson's way, including one on "Playhouse 90'' in 1957, and he did a pilot in 1960 for a prime-time series, "Johnny Come Lately,'' that never made it onto a network schedule. In 1958, Carson sat in for "Tonight Show'' host Paar. When Paar left the show four years later, Carson was NBC's choice as his replacement. After his retirement, he and his wife, Alexis, traveled frequently. The pair met on the Malibu beach in the early 1980s; he was 61 when they married in June 1987, she was in her 30s. Carson's first wife was his childhood sweetheart, Jody, the mother of his three sons. They married in 1949 and split in 1963. He married Joanne Copeland Carson that same year, but divorced nine years later. His third marriage, to Joanna Holland Carson, took place in 1972. They divorced in 1985. Carson won a Presidential Medal of Freedom, the nation's highest civilian honor, in 1992, with the first President Bush saying, "With decency and style he's made America laugh and think.'' In 1993, he was celebrated by the prestigious Kennedy Center Honors for career achievement. His nephew said there will be no memorial service. Associated Press writer Jeff Wilson contributed to this report. My Dad, Bill Damhorst, died in 1971. He was a BIG Johnny Carson fan. I recall he even had a "Johnny Carson" suit! Learning of Johnny's death rekindled fond memories of my Dad. My condolences to all. It is unthinkable that Johnny is no longer with us. His humor was unmatched--I feel fortunate to have been part of his audience all those years. No one in my lifetime will take his place. 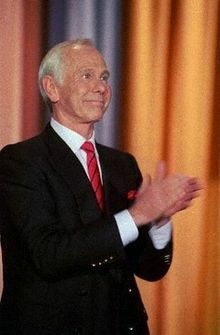 I was privaledged to be at the taping of the Tonight Show with Johnny Carson about 6 months before his retirement. Robin Williams and Jonathan Winters were on. What a treat! I also call Johnny "the man I spent my wedding night with." lol. I used to watch the Tonight Show and wait for the ball to drop in Times Square every New Year's Eve. I got married New Year's Eve 1971..and true to form, I watched the Tonight Show. I'm surprised my husband didn't divorce me. Thanks for the memories Johnny! Thank you for the memories. you will be forever missed. Johnny was the best host the tonight show ever had. Unlike the current host Johnny would at least have guest hosts from time to time. I guess Leno is still insecure.